Rebecca Noble and Rebecca Noble and Rebecca Noble | The Daily Wildcat Ray Smith celebrates Dusan Ristic's shot from the bench during a game against Washington State on Jan. 16. The day was Nov. 1, 2016. The Arizona men’s basketball team was getting ready to kick off their season with a harmless exhibition game against the College of Idaho, a NAIA school known more for their skiing program than their basketball one. The game, however, wasn’t meaningless to Ray Smith. 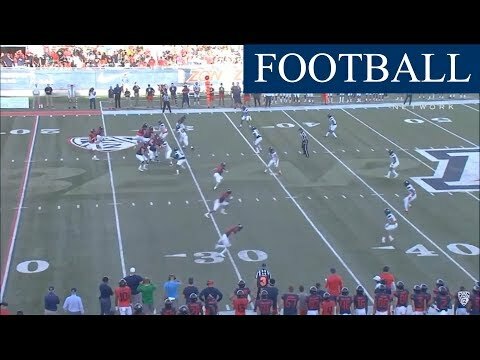 At the 15:12 mark of that game, Smith made his official debut for Arizona, 846 days since he tore his ACL the first time. He made his first field goal with 14:03 left in the second half, putting Arizona up 64-19. Smith had come full circle, successfully making it back from two torn ACL’s ready to be a key contributor. Less than two minutes later, Ray Smith’s basketball career would be over. At the 12:52 mark, Smith went up for a layup and fell next to the basket. He immediately signaled for help, making a throat-slashing gesture. Athletic trainer Justin Kokoskie and head coach Sean Miller both came out to check on him, and a silence fell over McKale Center. Smith was carried to the locker room, and the 86-35 victory became an afterthought. Arizona forward Ray Smith (24) grimaces as he fall injured to the ground during Arizona's blow-out 86-35 exhibition win over the College of Idaho at McKale Center on Tuesday, Nov. 1, 2016. Two days later, his MRI came back. Smith didn’t need to see the MRI results to know what they confirmed: He had torn his ACL for a third time, this time tearing his right ACL again. He would announce his retirement from basketball that same day in a post on Twitter, thanking those around the program who believed in him during his journey, from fans to coaches and teammates. It is easy to think this is where the story of Ray Smith ends, but in fact, this is where it begins. Smith spent last season in a sort of student-assistant role, doing his best to still be connected to the game that allowed him to stay on scholarship despite his injury. He traveled to Spain with the team and did his best to be around the program. Smith then decided to shift his focus from student-athlete to just student. He is currently a Care Health and Society Major set to graduate in May. Only three players remain on the Arizona roster from the ’16-17 team (Dylan Smith, Jake DesJardins and Kory Jones), but Smith said he still keeps in contact. The No. 18 player in the nation, Smith was part of a 2015 recruiting class that was No. 3 in the nation, per 24/7 Sports, the highest under the Sean Miller era. That 2015 class was one of the most successful at the NBA level in recent memory. It included players such as Ben Simmons, Donovan Mitchell and Jamal Murray. Smith was ranked ahead of players such as Mitchell, Dejounte Murray and Aaron Holiday, a “bittersweet” feeling according to him. The class Smith came to Arizona with have all taken various paths in their basketball journeys. The class headliner was Allonzo Trier, who has become a fixture in the New York Knicks’ rotation this season, earning a NBA contract despite going undrafted. Justin Simon was unable to crack the rotation for Miller in his lone season on campus, averaging 7.5 minutes in 24 games. He elected to transfer to St. John’s, where he has proven to be a key contributor, averaging 12.2 points per game and starting all 33 games last season. The last member of the class was Chance Comanche, who averaged 4.9 points and 2.8 rebounds during his two seasons for the ‘Cats. Comanche was an intriguing pro prospect due to his length and athleticism, but probably could’ve used an extra year or two in college to fully develop his game. The commitment of Deandre Ayton, along with the return of Dušan Ristic, meant Comanche would probably have seen limited action last season, so he decided to test the pro waters. He is currently a member of the Canton Charge, the G-League affiliate of the Cleveland Cavaliers. Former Arizona forward Ray Smith smiles from the bench during Arizona's 78-66 win over CSUB at McKale Center on Tuesday, Nov. 15, 2016. While Smith may have been robbed of his dreams of an NBA career due to his bad luck at Arizona, he hasn’t let it wear on his personality. Always cracking a smile and joking around campus, Smith has been upbeat since that day in 2016. Basketball will still be a thing for Smith, just not as much about him. Although he still does play from time to time, Ray’s brother Donovan turned 11 in December, and he wants to be there for him during his journey. “I want to be really involved with my little brother as he comes up playing basketball,” he said. The game of basketball has been a blessing and a curse for Smith. While injuries may have taken away our chance at seeing him posterize defenders and knock down jump shots at the next level, the game has allowed Smith to grow as a person and gain an education and a new outlet to succeed in whatever he chooses.